Fees adhere to the regulations established by the State of California. We offer discounts for groups who have regular, multiple document signings. 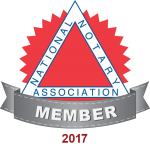 Mobile Notary Fees are negotiable and must be confirmed before the appointment is set. Proof of identification required for all signing parties. Parties signing must be responsible and aware, and signing at own free will. Please get any legal questions about the documents answered before arrival for signing. Any required witnesses must be present at time of signing. Please feel free to call if you have any questions prior to signing. MUST HAVE ORIGINAL STATE OR FEDERAL ISSUED ID OR DL AVAILABLE BEFORE SIGNING. If you do not have acceptable ID for someone who is incarcerated in the Jail, but have two individuals who have the proper ID and know the person who is incarcerated, We can notarize the Documents.